"Monsters like Dracula, the Wolf Man, Frankenstein’s monster and the Creature from the Black Lagoon are the stuff that nightmares were made of. These classic creatures, a staple in the Universal Studios film history, have inspired countless impressionable children to tune in to their creative core. Scores of artists, Film makers, and writers owe a debt to the exciting terror these icons of horror invoked. 'It’s only fitting that these marvelous monsters are granted a fitting tribute. 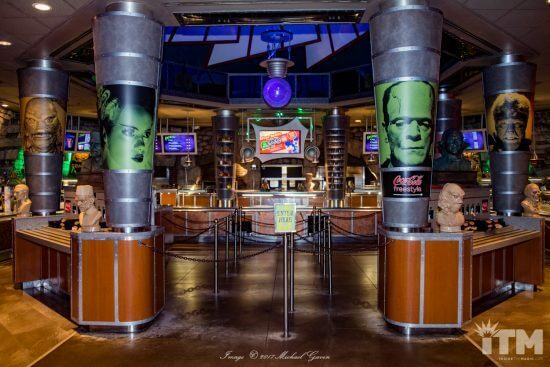 Universal Studios’ Classic Monster Café, at Universal Studios Florida, honors these horror heavies in a dazzling display monster memorabilia, movie posters and life size monster mannequins. Opened nearly twenty years ago, the restaurant recently received a much needed make over." Am I the only one who sees the irony of Universal redecorating their place with....UNLICENSED garage kit items, and Tom Savini Basil Gogos things. None of which are licensed either,lol. I guess even they realize the best stuff that's being done is by fans, freed from the constraints of style guides and green jackets,lol. Planning on going this time next year. Will definitely stop by for a bite. should have consulted us here at The UMA! Now why they don't put that much effort into merchandising and movies is beyond me. I had lunch there recently. Very cool place. The family and I are headed down to FL in February and will be doing 1 day at Universal. I've already demanded that we eat here, lol. This looks better than what I expected, can't wait!!! Does anyone know if they sell any Monster merch at the cafe or on park property?